Q4, and most especially the holiday shopping season, is make or break for a huge number of brands and consumer products. Because of this, the advertising world in general and social advertising in particular tends to see a corresponding increase in the number of advertisers and the size of their budgets. With both an increase in spend from established social advertisers and an influx of brands and products entering into social over this period to increase exposure, it stands to reason that the value of a dollar spent over this period will become more uncertain. To provide concrete guidance on how your company can succeed during the holiday season, we delved into 11 months of data from 2015 and 2016. Our results suggest that the holiday season has a variety of effects, with Impression-based metrics such as CPM seeing a major increase in cost while Website Click, Engagement, and Video View-based metrics are relatively unaffected or even improved by the holidays. The results and discussion of our findings are paired with suggestions for each metric to help structure your campaigns to maximize your results. 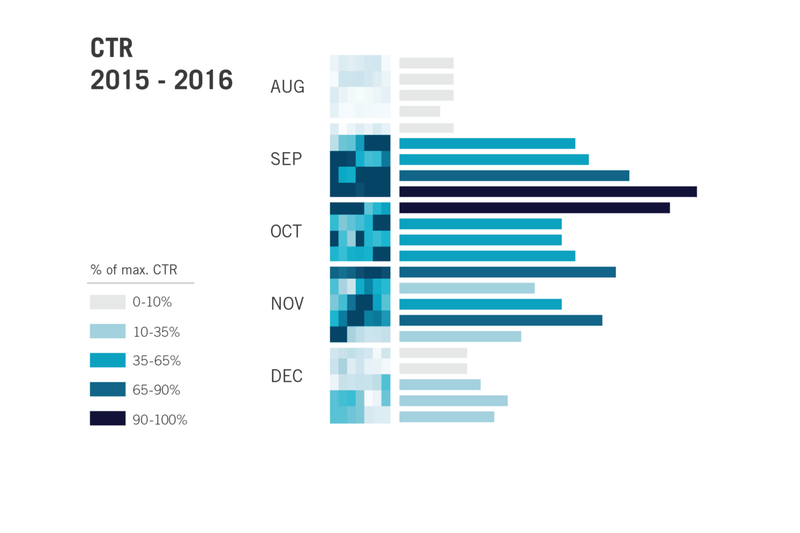 For this study, we looked at Facebook and Instagram data from all HYFN accounts between May 2015 to March 2016. Engagements encompass Video Views, Website Clicks, Post Likes, Post Comments, and Post Shares. We looked at a total of seven rates and metrics over this period: Clickthrough Rate (CTR), Engagement Rate, Video View Rate, Cost Per Impressions (CPM), Cost per Click (CPC), Cost per Engagement (CPE), and Cost per Video View (CPV). These metrics were looked at over daily, weekly, and monthly time periods, where each metric was calculated using the overall totals of the base metrics during the period. 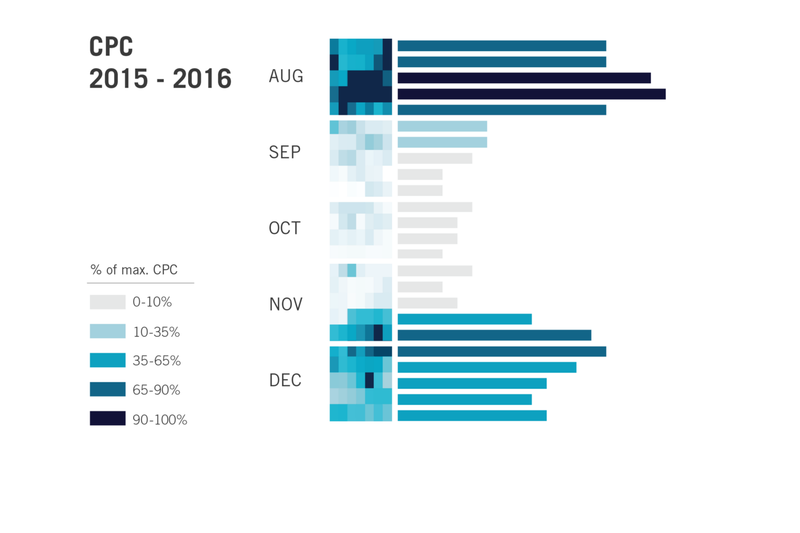 Each heat map in this article covers five months of data for the metric signified in the chart title. The bars represent the metric over a weekly basis while the grids show the monthly breakdown of the metric by day on a Sunday-Saturday setting. The darker a bar or day, the closer that time period is to the metric maximum over that period. 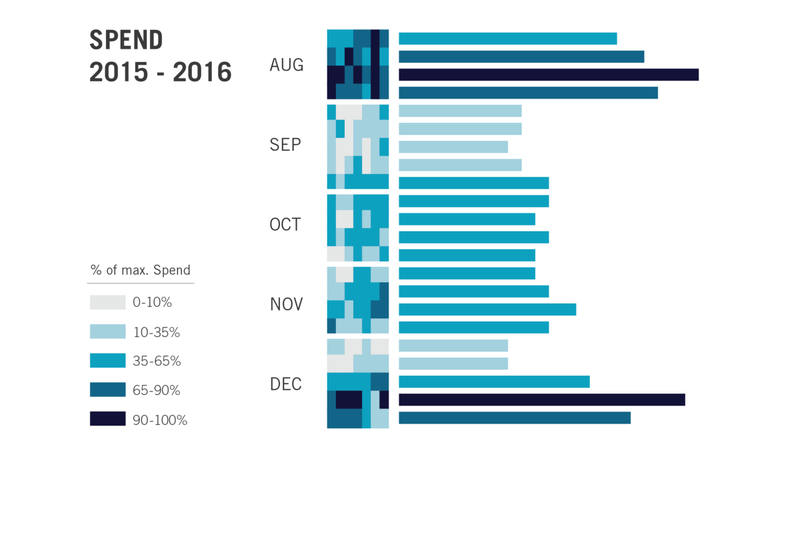 For example, if our maximum spend for a week was $100, the darkest blue segment would indicate weeks where spend was between $90-$100. CPM shows a noticeable increase over the winter holiday season. Surprise! During the period from one week before Black Friday through the end of the year, CPM is on average 45% higher than the previous period, which includes both the Halloween and Veteran’s Day holidays. This CPM increase peaks in the week leading up to Christmas Eve, followed by a drop off over Christmas Eve and Christmas and another smaller spike leading into New Year’s Eve. 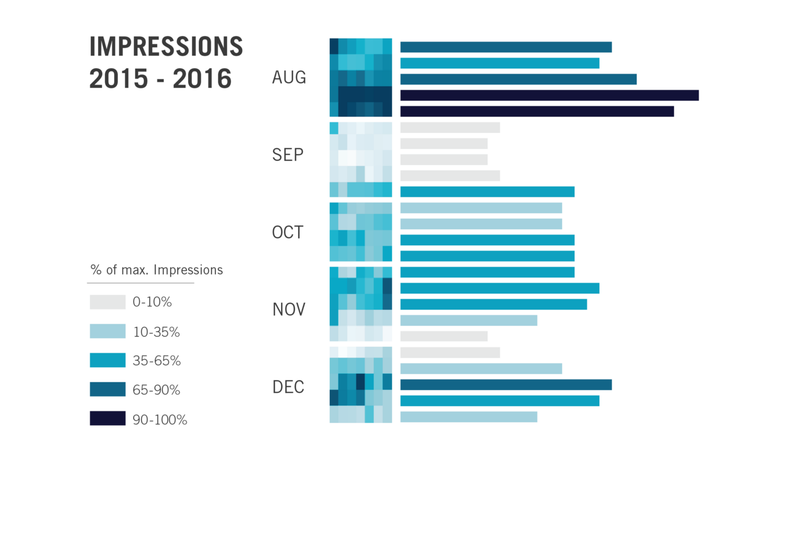 This shows evidence of a substantial Impressions premium during the holiday season and suggests that a CPM-based (awareness) optimization strategy is not a sound one over the period. In essence, more accounts are vying for a temporarily smaller audience pool, pushing up the cost of CPM over the holiday season. Increased competition for audiences during the holiday season means that prices will rise as this demand increases, diminishing the return an advertiser receives per dollar spent. Given this scrap for diminished returns, we’d recommend shying away from using campaigns with a CPM-only objective over the holiday season. We’ll be exploring Clicks, Engagements, and Video Views in the following sections that all provide advantages over CPM-only objectives during the holiday season. If an alternative is not an option, tilting spend toward the beginning of the season will at the very least allow for spending more at lower CPM levels and tapering off as CPM increases approaching the holidays. 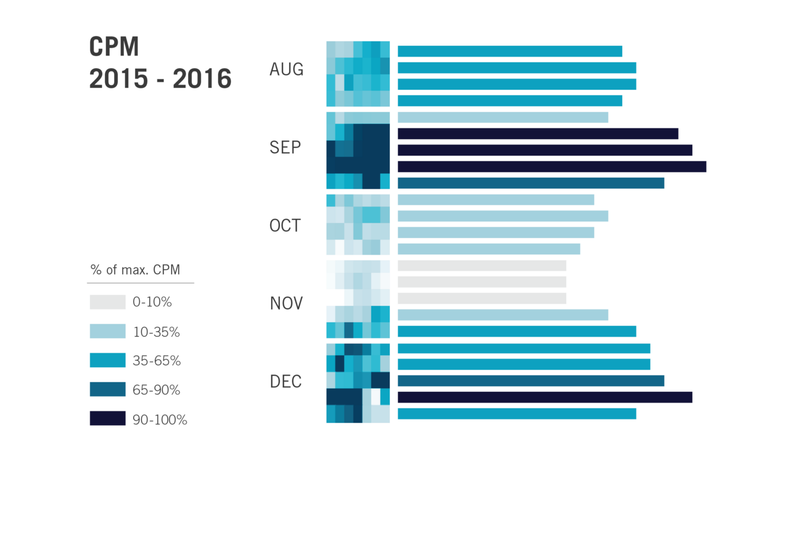 The months of September, October, and November contain the most efficient CPCs and CTRs: for these three months, CPC is 62% lower than the rest of the observed period while CTR is 38% higher. Consumers know they have many options to choose from and will click around to your site, and your competitor’s site, while working through their internal purchase decision cycle. This is helped by the week leading into Thanksgiving, Black Friday, and Cyber Monday, which had the second-lowest CPC of any week observed. This could be due to advertisers holding off on ads until a day or two before the actual shopping holidays, leading to a bit of a dead week as advertisers save up their spend for the big days. The highest CTR is observed during the three weeks in September post-Labor Day. Conversely, December is an expensive month, generating a monthly CPC that is 39% higher than average. On a weekly level, the week before a holiday has a CTR that is 10% higher than a holiday week and 48% higher than all other non-holiday weeks, along with a CPC that is 11% lower than a holiday week and 35% lower than all other non-holiday weeks. On a daily level, the CPC of a holiday is 13% higher and its CTR is 25% lower on a holiday compared to the day before it. 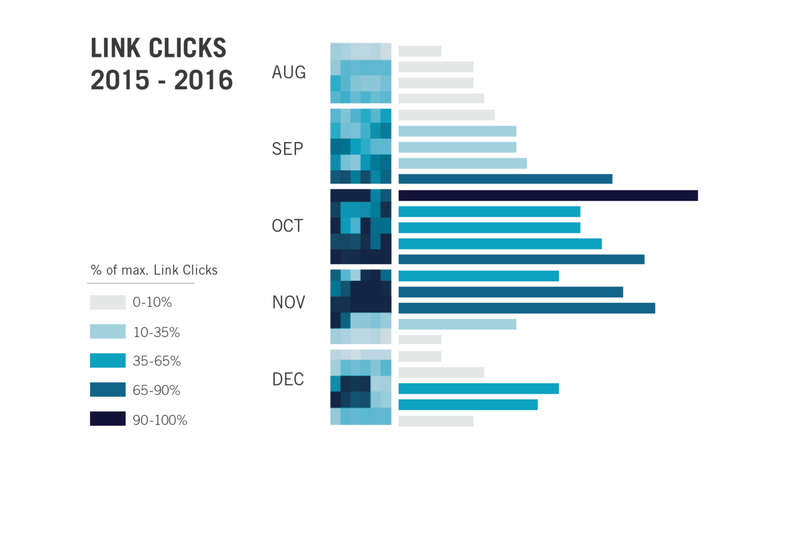 Based on these results, Clicks shows considerable advantages over CPM during the holiday season if one plans appropriately. Similar to the CPM recommendation, push spend more toward the more cost efficient early periods in the holiday season. The low CPCs in September, October, and November prior to the week of Thanksgiving allow for a much more efficient allocation of spend than in a CPM campaign. If you have the option, allocate the bulk of the spend ahead of Thanksgiving with a ramping down heading to December. This will help ensure that Click metrics are stronger for the overall campaign versus an even or December-heavy spend allocation. At first glance, the trend for Engagement objective campaigns seems to mimic the trends for Click objective campaigns. However, there are a few key findings that differentiate them from one another. 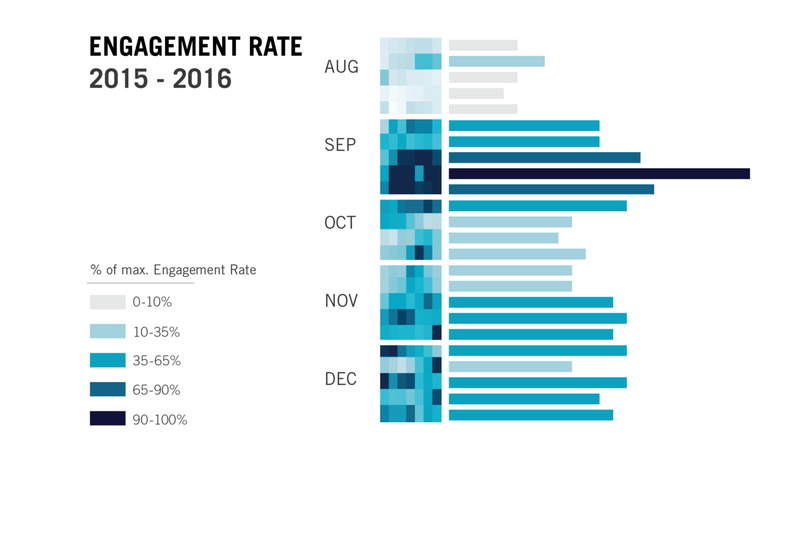 Engagement performance is strong in September, October, and November, but the premium on Engagements is less-severe than the one seen for Clicks. 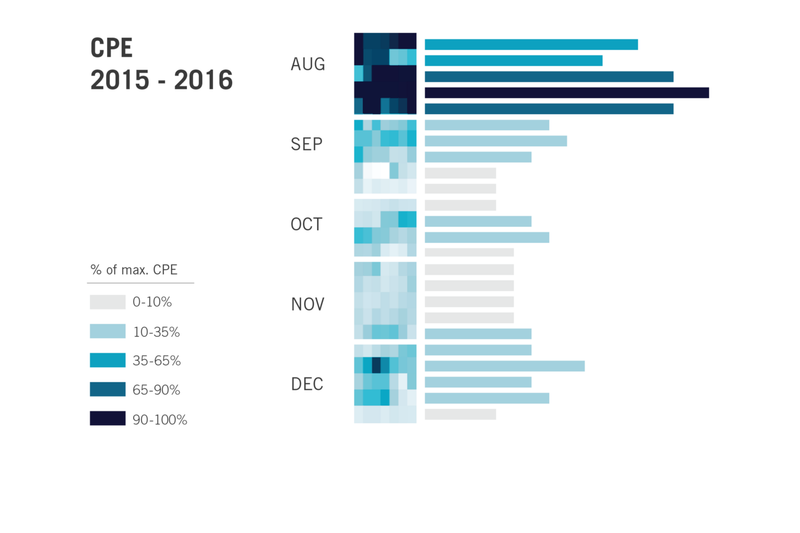 Engagements see a 36% increase in CPE from November to December, but also see a 4% increase in Engagement Rate over that same period, while Clicks sees a 141% increase in CPC from November to December along with a 41% drop in CTR. There is also essentially no difference in Engagement Rate and CPE between a holiday week and the week preceding it, and the CPE and Engagement Rate of a holiday week is on average 17% lower and 20% higher, respectively, than non-holiday weeks. However, when compared to the eve of a holiday, the holiday itself will on average obtain a CPE that is 3% lower but an Engagement Rate that is 13% lower as well, indicating a mixed bag for extending a campaign into the holiday itself. Focusing on Engagements for a campaign that has to run through the bulk of the holiday season presents a great metric-driven choice out there. While there will be a hit taken once the holiday spend premium kicks in, the effect will be felt less than in CPM or Clicks and there will be a minimal, if any, drop in Engagement Rate. Engagements also allow for a more even spend across the holiday season, though a slight tilt away from December will still improve the overall efficiency of the campaign. 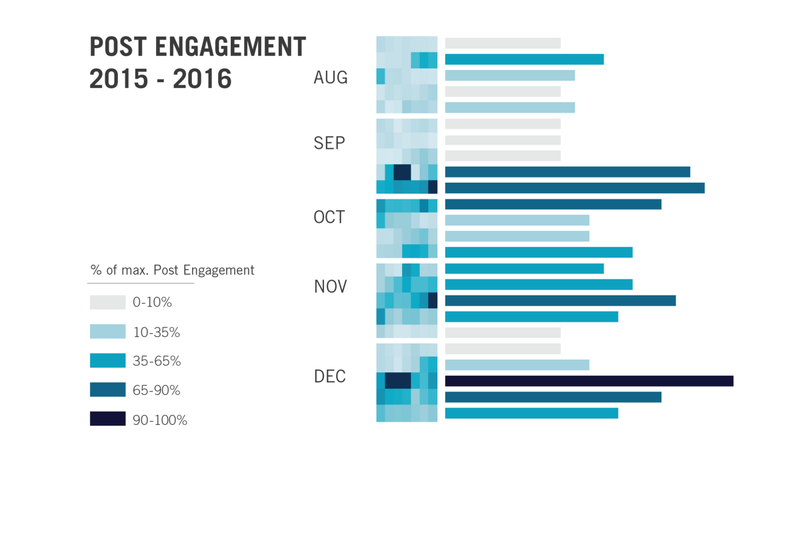 Engagements looks to be a relatively stable metric across the holiday season and should be an initial consideration when looking at advertising over this period. Classically, Click and Engagement optimized campaigns are focused on driving the audience to a site and/or interacting with the brand or product, while Video Views campaigns are about driving awareness and consideration of the brand or product itself. That being said, Video Views are the one base metric that actually showed an improvement moving from November to December, with a 10% drop in CPV and a 56% increase in View Rate from month to month. This similarly transfers to a weekly time scale, as a holiday week on average sees a CPV that’s 9% lower and a View Rate that’s 9% higher than a non-holiday week, while the week before a holiday week sees a CPV that’s 5% lower and a View Rate that’s 2% higher than a holiday week. 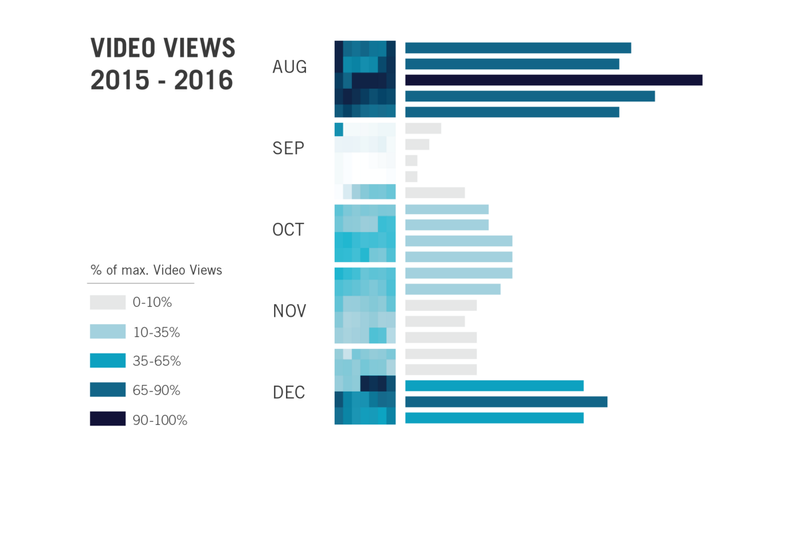 Even though there might be a slight slowdown into a holiday week, Video Views tend to be quite even over the holiday season and even improve heading into the bulk of the season in December. 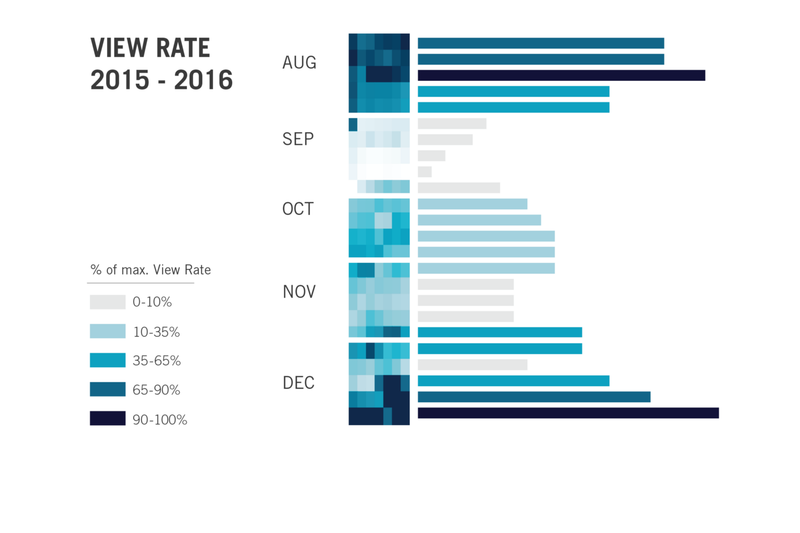 More impressive is that all four full weeks in January 2016 had the most efficient CPV and higher than average View Rate over the period studied. In fact, going from December to January sees a decrease of 64% in CPV and an increase of 69% in View Rate. CPV stays consistent until a week before Super Bowl Sunday. The barrier to entry for Video View campaigns is much higher than the previous three tactics, as one needs to not only produce a video, but also one that’s highly engaging. However, the payoff for it in terms of efficiency is undeniable. A focus on producing a video campaign that can target the meat of the holiday season from Thanksgiving through to Christmas Eve with spend tapering off going into the week before Christmas Eve should provide maximum benefit of a Video View-based campaign over this time. If the brand has enough resources to produce multiple or many videos, focusing on a post-holiday series of ads to promote brand awareness in the cheap landscape of January presents a virtually untapped landscape. The holiday season is the peak of the shopping season and represents the yearly apex for many products and brands. Social advertising during this period is a natural extension of this apex, as a well-executed advertising campaign during the holiday season can boost revenue greatly at a fairly low cost. However, not all goals are created equal during this season, and knowing which optimization path provides the best bang for your buck could be the difference between an average or exceptional return on your investment. Every brand and product will require a campaign that works for their specific needs, but there are some overarching trends that can be used as a guideline to help one decide what kind of campaign is the right one to run. Based on our results, campaigns optimized for impressions should be avoided, as they perform poorly during the holidays relative to other objectives and also have a high spend premium for the holiday season. 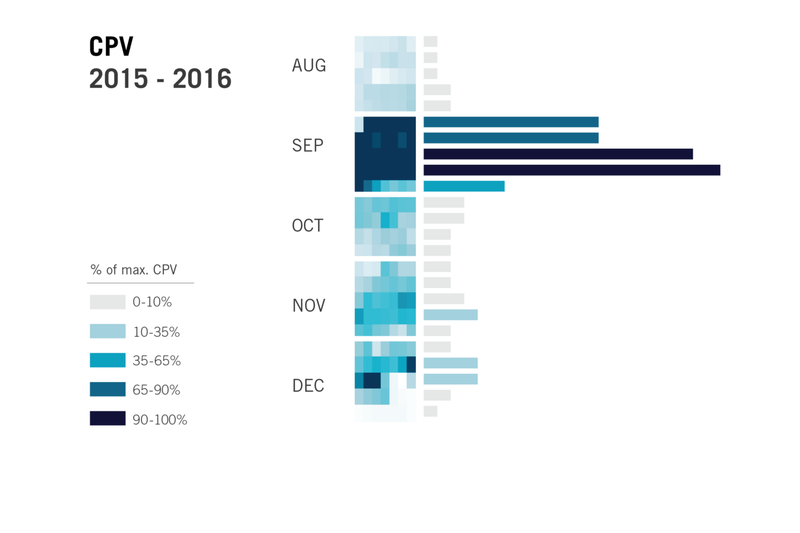 Conversely, a Video View campaign represents the strongest opportunity for success heading into the holiday season, as December sees an overall decrease in CPV and increase in View Rate in December versus November. If a Video View campaign isn’t ideal or cost-effective, an Engagement based campaign should have a relatively small spend premium over the holiday season with little effect on Engagement Rate. However, an Engagement campaign doesn’t guarantee any downstream performance, so if a campaign is focused on driving to site, it may not be as efficient in achieving this goal. In this case, a Clicks campaign would be necessary, though the holiday spend premium for CPCs is much higher than both Video View and Engagement campaigns. Tilting spend toward the period pre-Thanksgiving for the campaign will improve the overall performance of the campaign, as it will allocate more spend to a period of time that is less expensive for the same audience size.